ARGYLE, TX – Join Dallas All-Pro Tight End Jason Witten at the Jason Witten Football ProCamp presented by Albertsons and Tom Thumb. The camp takes place May 14 – May 15, 2016 at Liberty Christian School, 1301 US-377, Argyle, TX, United States, 76226. For Boys & Girls, Grades 1 to 8. Source: Procamps. 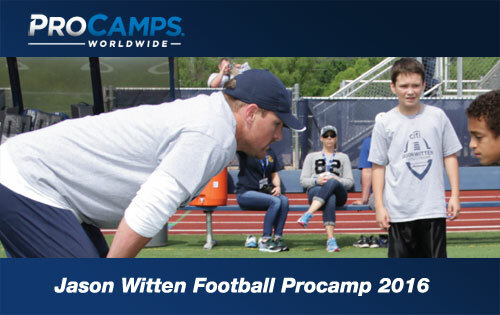 Throughout the two-day camp, Jason Witten and our camp coaches will offer tips and instruction. Campers will experience various stations specializing in fundamental football skills and will participate in games and contests. Campers will be placed in small groups by age to ensure that each child gets maximum instruction. Jason Witten is one of the most popular Dallas Cowboys players of recent times, tight end Jason Witten is an 8-time Pro Bowl selection. He played collegiately at the University of Tennessee. If you would like to book football speakers or professional athletes like Jason Witten for a speaking engagement, autograph signing, product endorsement, fundraiser or special event, contact a Jason Witten booking agent for appearance and speaker fees at Sports Speakers 360 or call 1.855.303.5450.